So goes the attention-grabbing extract on the back cover of this reissue of Malcolm Hulke’s 1976 novelisation of his story from Jon Pertwee’s final season. The single word most associated with this book, and perhaps with the story itself, wasn’t written by Hulke but was depicted in vivid block letters by cover artist Chris Achilleos – ‘KKLAK!’, that glorious comic-book style caption which makes this probably the most famous of all the Target covers. It’s reason enough to buy the book, one of seven from the Target range to be republished this month. The books, which come with a gold embossed Doctor Who logo, are rather lovely to look at but it can’t just be me who feels it’s a shame that BBC Books couldn’t find a way to incorporate the Target logo, just for old times’ sake. The introductions added to earlier reissues by the likes of Steven Moffat and Mark Gatiss which told us why these books meant so much to people who grew up reading them are sadly missing from this batch though we do get helpful information (‘The Changing Face of Doctor Who’) to fill us in on the Third Doctor, UNIT and Sarah Jane Smith and brief ‘About the Author’ details at the end. 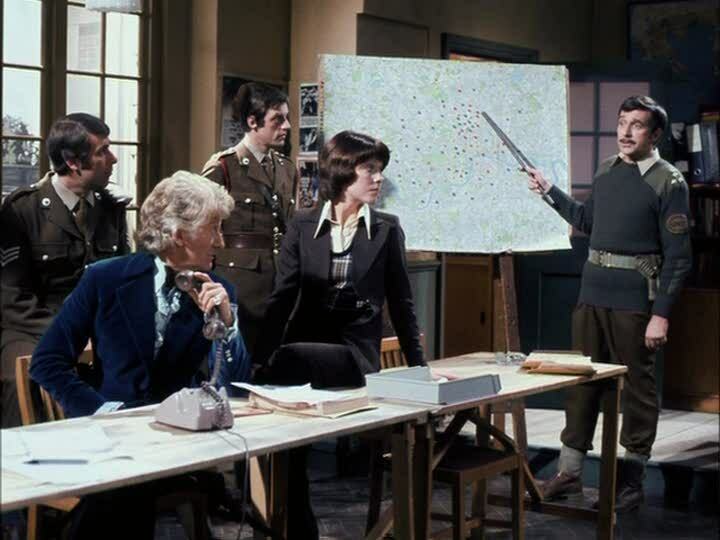 The story feels like a collection of ingredients which nicely sum up the Jon Pertwee era: the UNIT team dealing with a crisis, pre-historic monsters, the Doctor railing against officialdom, the Brigadier spending a lot of time on the phone… and there’s plenty of fun to be had reading a book that compresses six episodes of action into a page count well below 200 (an unsung skill of those Target writers that some modern authors could learn from). 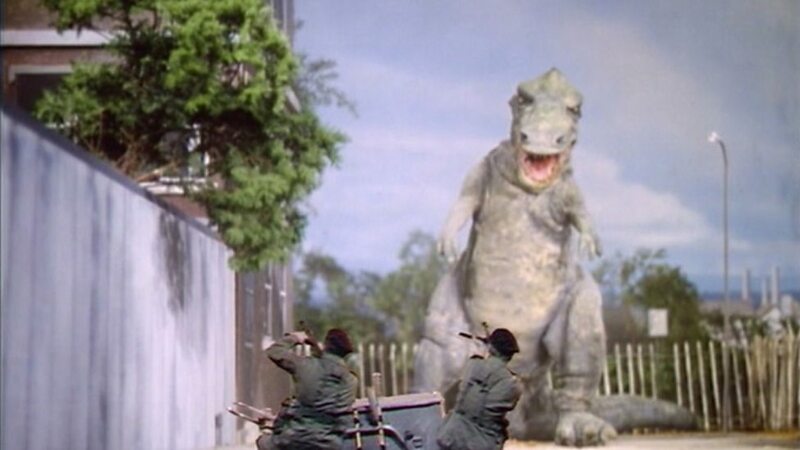 There are two main weaknesses to Invasion of the Dinosaurs which have meant that it’s never been widely regarded as a classic and have sometimes left it open to ridicule. 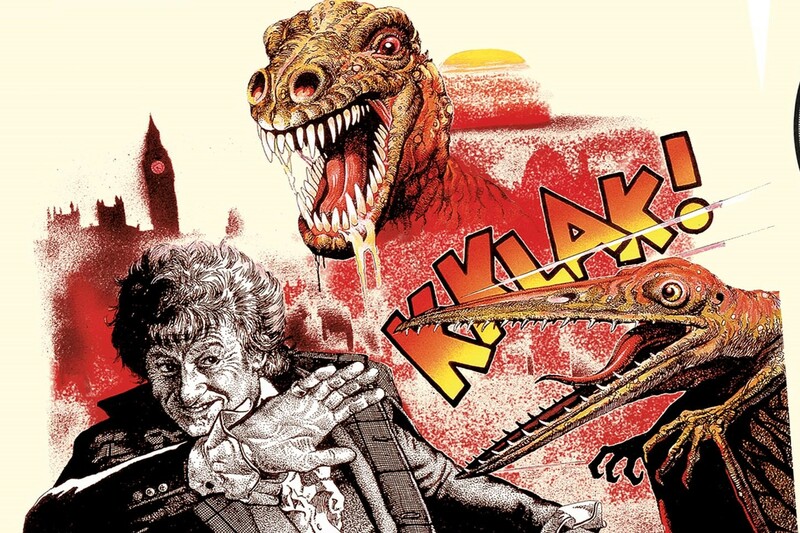 One is the dinosaurs themselves; famously rubbery, immobile beasts in the television version, a case of the Doctor Who production team’s ambition hugely exceeding what resources could deliver. This poses no problems on the page, however, where the reader’s imagination very easily makes up for any shortcomings when it comes to marauding dinosaurs, although it’s possible that youngsters buying the book back in the 1970s may have been a bit disappointed that the story doesn’t feature a bit more dinosaur action, especially if they were lured into parting with their pocket-money by that slavering t-rex on the cover. 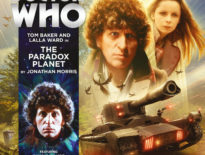 But it all adds up to a fun read, a slice of Doctor Who very much of its era and one which, taken as a package with that wonderful Chris Achilleos cover (look out for our interview coming up soon…) gives a reminder as to why readers who bought these books treasured them so much. Malcolm Hulke is one of the most fascinating characters to have worked on Doctor Who is its long history, a Navy veteran and Communist Party member who, as was recently revealed in declassified files, was monitored by MI5. As the book’s notes mention, his scripts typically present us with no clear villains but rather characters with an alternative, valid point of view. 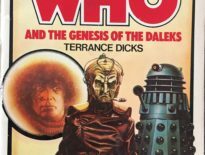 It may be first and foremost a rollicking adventure but it’s impossible to read Doctor Who and the Dinosaur Invasion and not feel, knowing what we now know about its author, that he had a good deal of sympathy with the people who through Operation Golden Age sought to return the world to an earlier, simpler time. 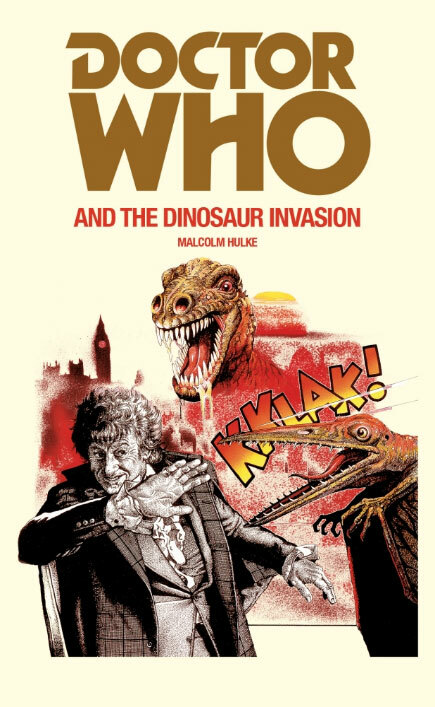 The Target reissue of Doctor Who and the Dinosaur Invasion by Malcolm Hulke is released Thursday, 28th April.